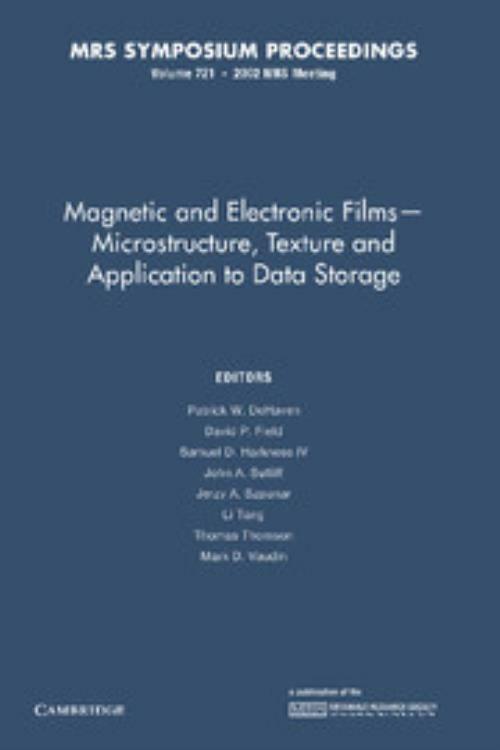 This book, first published in 2002, provides an interdisciplinary discussion of magnetic and electronic films and the importance of new materials in magnetic data storage is underlined by the accelerating pace of areal density growth. It covers a wide range of novel materials with data- storage potential. In particular, new work on lithographically-defined nanostructures and nanowires shows exciting possibilities for the future, including patterned media and magnetic logic operations. New work on chemical methods to produce ferromagnetic particles less than 10nm in diameter, with extremely narrow size distributions, indicates promise. Presentations also reflect the growing interest in textural and microstructural control in thin-film technology. Materials systems in which links between crystallographic texture, microstructure and properties are studied including metal films, electronic films including ferroelectrics, and transparent conducting oxides. Presentations display a significant variation in the sophistication of texture-measurement techniques, depending on application and equipment availability. The technique of electron backscatter diffraction (EBSD is strongly featured. David P. Field Washington State University. Jerzy a. Szpunar McGill University, Montréal. Mark D. Vaudin National Institute of Standards and Technology, Maryland.